Water shapes the geography and biodiversity of Nicaragua. However, there are still people without access to clean water and reliable toilets. Learn more about the different types of projects we implement. Find out how you can help fulfill our mission in Nicaragua. Our headquarters are located in Bilwi, a small city located in Puerto Cabezas in the North Caribbean Coast Autonomous Region. The region is predominantly a Miskito territory but also celebrates its richness in culture and diverse ethnic groups. We are the #1 international not-for-profit organization dedicated exclusively to clean water, sanitation and hygiene. We started in 1981, with the purpose of helping people break free from poverty and change their lives for good by tackling these three essentials: clean water, reliable toilets and good hygiene. We have programs in over 28 countries and together with communities, we have reached more than 25 million people around the world with clean water and more than 24 million with reliable toilets. In Nicaragua, like in many other countries in Latin America and the Caribbean, a large portion of the population lacks access to clean water, sanitation and hygiene services. In 2015, approximately 1.9 million people were estimated to have no access to reliable toilets and more than 400,000 people had no option but to practice open defecation. While progress has been made in regards to access to water, there are still around 800,000 people without coverage and among those who report to have access, many do not have water every day or face severe quality problems. In July 2011, WaterAid launched its first program in the Latin America and Caribbean region in Nicaragua in the North Caribbean Coast Autonomous Region , where the poverty rate is approximately 58%, surpassing the national average. According to national data, water coverage is 16.79%, 22.93%, 20.48% and 6.98% in the municipalities we work in:Puerto Cabezas, Waspam, Waslala and Rosita respectively. Approximately 15% of the country's total population lives In the Caribbean Coast Autonomous Regions, making it the second most populated region of Nicaragua, after the capital, Managua. These regions are home to most of the indigenous (Miskito, Mayagna, Ulwa, Rama) and Afro-descendant (Creole, Garífuna) populations of Nicaragua. The North Caribbean Coast Autonomous Region (RACCN) is the region with the largest territory in the country. 72.3% of its population is of Miskito origin, 21.7% is of mestizo origin, 5.7% of creole origin and 0.3% is Mayagna. You can hear Creole, English, Spanish and Miskito spoken with charm and elegance throughout the region. Despite its vast territorial extension, its ethnic and cultural diversity and the richness of its natural resources, the North Caribbean Coast Autonomous Region has one of the the highest rates of poverty in the country: almost 68% of its rural population and 28% of its urban population live on less than $1 per day. One of the main problems is the inadequate access to clean water and sanitation. Our intervention focuses on the municipalities of Puerto Cabezas, Waspam, Rosita and Waslala, where the vast majority of the population is not connected to municipal water systems or infrastructures are non-existent. In the peri-urban and urban neighborhoods of those municipalities, many people defecate out in the open, which contaminates water sources and impacts the health of families. The most affected groups are women and children, mainly because they are the ones responsible for collecting water several times a day and often walking long distances. We focus on different areas of water, sanitation and hygiene (WASH) to support women, children and rural indigenous communities. Each approach requires different projects and dynamics. One of our priorities is to equip communities with the resources they need to empower themselves and build local capacity to ensure the sustainability of projects. By working together, we can help reduce the exclusion of these marginalized communities. We promote healthy practices in hygiene, sanitation and water as a strategy to improve maternal and neonatal health. Improving WASH conditions in health centers helps reduce the rate of diseases like diarrhea, which is commonly caused by contaminated water and is the second biggest cause of death among children under the age of five. Read our report "Transforming health systems: the vital role of water, sanitation and hygiene" to learn more about WaterAid's work in the health sector. We work with schools to bring access to clean water, reliable toilets and hygiene education. Worldwide, only 71% of schools have access to clean water and only 69% have access to bathrooms. This has a negative impact on the health, attendance and participation of students. In addition to helping improve the quality of the educational experience, our work in schools demonstrates effective solutions for access to clean water and improved sanitation that are often replicated and expanded into homes and communities. We build alliances with diverse stakeholders to coordinate efforts and improve the WASH situation in marginalized communities in Nicaragua. By working together, we can foster local, sustainable and resilient development. Many people in the North Caribbean Coast Autonomous Region (RACCN) and in other parts of Nicaragua still do not have access to clean water and reliable toilets. 1,079,000 people do not have access to clean water. 1,438,000 people do not have access to reliable sanitation. Almost 30% of the population lives in extreme poverty. 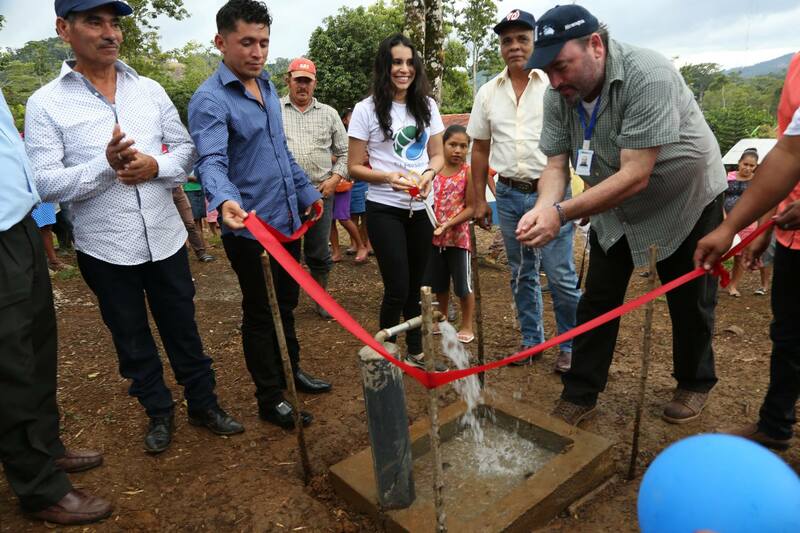 Share WaterAid Nicaragua’s mission with colleagues, friends and family! All the work we do in Nicaragua would not be possible without the dedication of our team, the motivation of our communities and your support. The WaterAid Nicaragua team is made up of a total of 20 people between our central office in Bilwi, Puerto Cabezas and our satellite office in Managua. On any given day you can find the program team working with the people in the communities and the management team ensuring that everything is working well. The days are full of hard work but also a lot of joy and new friendships.